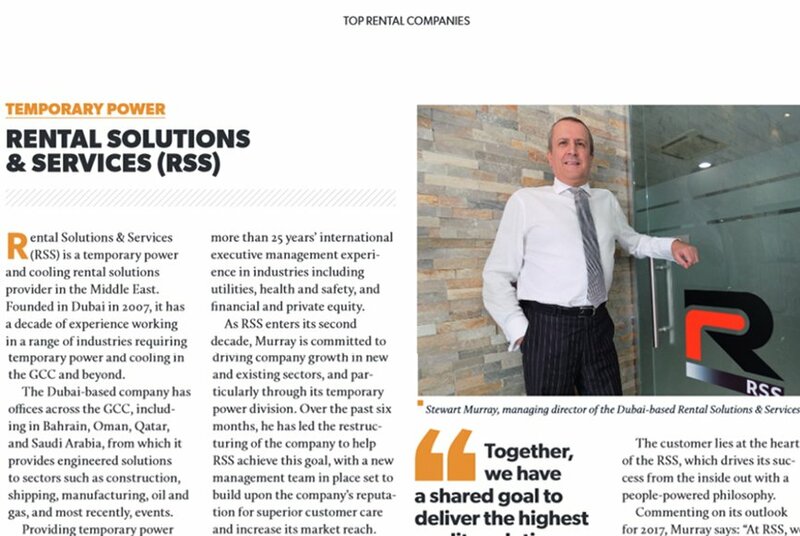 Rental Solutions and Services – temporary power provider has been included in the prestigious annual round-up of top rental companies by PMV Middle East magazine. PMV Middle East interviewed RSS Managing Director Stewart Murray, who said: “At RSS, we have a dynamic new management team that is committed to adding value to the business, its customers and its employees. For us, the philosophy behind this growth is simple: ‘employ great people to deliver great service’. “Together, we have a shared goal to deliver the highest quality power rental solutions and services in the marketplace. Our technicians take pride in their work and are the best in the business, able to advise customers on the bespoke solutions for their needs.